Our God is a God of justice and He never perverts it. We are to be followers of the Lord and we’re to never judge unfairly. God will give everyone what they deserve. It is said by many fake Christians that God loves and He never hates, which is a lie. Satan is deceiving people so they can rebel against God’s Word. Jesus didn’t come so you can keep on sinning. Shall we continue in sin that grace may increase. If you love kids that means you hate abortions. God loves, but He hates the wicked. It’s not the sin that will be thrown into Hell it’s the wicked person. If someone killed your family members and the judge let him go free, you would be outraged and you would feel like the law doesn’t stand. God is an honest judge. He will not let evildoers go free and if He did He would be a liar and He would be unjust. How can God forgive the wicked and still be just? How can a Holy God have fellowship with evil people? God came down from Heaven and He measured out the punishment. It was God who shed His blood. Jesus Christ was crushed for your sins and it pleased God to crush His son. God’s love was poured out on the cross. Justice was served on the cross. The price for your life was paid in full. Your life is not your own. He is your everything and without Him you wouldn’t have life. When you truly believe in Christ and what He did for you, you won’t want to go back to those things He died for. Remember that the Bible says to repent. True faith in Christ for salvation will change your life. The Lord’s sheep will hear His voice. We must never stop preaching about the doctrine of regeneration. 2. Isaiah 56:1 This is what the LORD says: “Be just and fair to all. Do what is right and good, for I am coming soon to rescue you and to display my righteousness among you. 3. Proverbs 18:5 It is not right to acquit the guilty or deny justice to the innocent. 4. Isaiah 1:17 Learn to do good. Seek justice. Help the oppressed. Defend the cause of orphans. Fight for the rights of widows. 5. Proverbs 17:15 He who justifies the wicked and he who condemns the righteous, Both of them alike are an abomination to the LORD. 6. Deuteronomy 16:18-20 “Appoint judges and officials for yourselves from each of your tribes in all the towns the LORD your God is giving you. They must judge the people fairly. You must never twist justice or show partiality. Never accept a bribe, for bribes blind the eyes of the wise and corrupt the decisions of the godly. Let true justice prevail, so you may live and occupy the land that the LORD your God is giving you. 7. Leviticus 19:15 “Do not twist justice in legal matters by favoring the poor or being partial to the rich and powerful. Always judge people fairly. 8. Job 8:3 Does God twist justice? Does the Almighty twist what is right? 9. Job 34:12 Truly, God will not do wrong. The Almighty will not twist justice. God is just. He gives everybody what they deserve. 10. Deuteronomy 32:3-4 I will proclaim the name of the LORD; how glorious is our God! He is the Rock; his deeds are perfect. Everything he does is just and fair. He is a faithful God who does no wrong; how just and upright he is! 11. 2 Thessalonians 1:6-8 God is just: He will pay back trouble to those who trouble you and give relief to you who are troubled, and to us as well. This will happen when the Lord Jesus is revealed from heaven in blazing fire with his powerful angels. He will punish those who do not know God and do not obey the gospel of our Lord Jesus. 13. Hebrews 6:10 God is not unjust; he will not forget your work and the love you have shown him as you have helped his people and continue to help them. 14. Psalm 89:13-14 Powerful is your arm! Strong is your hand! Your right hand is lifted high in glorious strength. Righteousness and justice are the foundation of your throne. 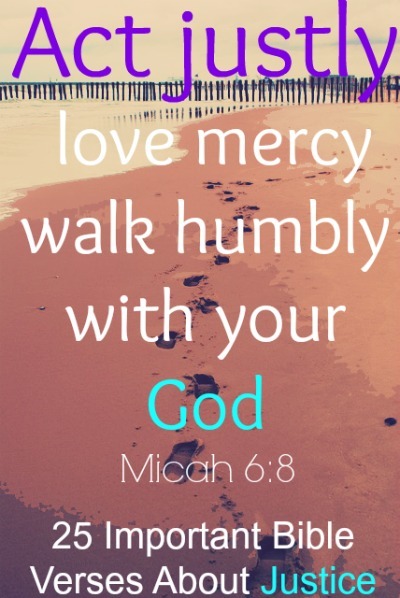 Unfailing love and truth walk before you as attendants. Anyone who lives a continuous sinful lifestyle is not a Christian and our just God is going to send that person into eternal fire, pain, and torment. Turn away from deliberately sinning, repent, and trust in Christ for salvation. 15. Exodus 23:7 Have nothing to do with a false charge and do not put an innocent or honest person to death, for I will not acquit the guilty. 17. Galatians 6:7 Do not be deceived: God is not mocked, for whatever one sows, that will he also reap. 18. Psalm 5:5 The foolish shall not stand in thy sight: thou hatest all workers of iniquity. 19. Proverbs 31:9 Yes, speak up for the poor and helpless, and see that they get justice. 20. Exodus 23:3 and do not show favoritism to a poor person in a lawsuit. 21. Exodus 23:6 “Do not deny justice to your poor people in their lawsuits. 22. Amos 5:7 There are those who turn justice into bitterness and cast righteousness to the ground. 23. Proverbs 17:23 The wicked take secret bribes to pervert the course of justice. 24. Isaiah 33:5 Though the LORD is very great and lives in heaven, he will make Jerusalem his home of justice and righteousness. 25. Proverbs 29:7 The righteous care about justice for the poor, but the wicked have no such concern.